The goal of all ghost hunters is knowledge. There is a lot involved in studying ghosts, hauntings, and poltergeists, and there are many tools of the trade to assist us in our search. Although these tools are useful you should never come to rely on them. By this I mean the truest devices are your own senses. Don't let technology get in the way of an investigation. The tools described below can help you detect the possible presense of a ghost, they are not scientifically proven ghost finders, they only pick up energy that is similar to what you may find in the presense of a ghost. In other words, they don�t find the ghost itself, only the energy that is associated with them. It is important to know that these tools are used as a backup to the witnesses statements or to actual events, reading are useless by themselves. These are the hi-tech tools of the field that have taken some of the guess work out of the equation while in the field. These tools have been incorporated into ghost hunting because they're precise tools of measurement and offer clues to the whereabouts of ghosts or haunted areas. EMF Detector - This is also known as an ElectroMagnetic Field detector. This device measures changes in local magnetic or electric fields. 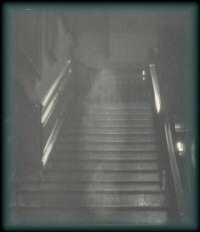 It is believed that ghosts will register a reading where no previous one was detected (mapping out the site with readings before jumping to conclusions is key). The major problem with an EMF detector is that electronic devices in the home and powerlines in the immediate vicinity will have an effect on it. So many things affect an EMF detector: the atmosphere, sun, pipes, flashlights, cell phones, certain watches, anything plugged in even if it's turned off, most people also have a magnetic signature. All of this must be taken into account as you survey an area. This device needs to be used as a backup for a witnessed event or to supplement other evidence gathering tools. A EMF spike alone does not offer any evidence of paranormal activity, the device must be used in conjunction with other tools - specifically an occurring event (apparitional event) or in a specific location (haunting)....the point is it to back up what a witness has seen or encountered...this point can not be repeated enough!. It is also somewhat reliable to use an ordinary compass for this task, your results may not be as easy to read or as presice, but you will get results nonetheless (watch for the needle to jump). In looking at EMF detectors there are two popular ones on the �ghost hunter� market. They are both fairly similar but will provide different results. The Trifield Meter is the model of choice. When using this device in the field it is best used in magnetic mode and be aware of anything that has electric power as this will trigger the meter. The second most popular meter is the Trifield Natural Meter, the biggest difference with this model is that it detects natural sources and not man-made sources. This difference causes the meter to be ineffective when moving through the environment, so this meter must remain in one spot. I use it primarily while interviewing clients to see if there may be any activity near them (both meters are ineffective for poltergeist experiences by the way). Infra Red Thermal Scanner - This device uses an invisible (or visible in some models) laser beam that points to a specific area and measures the temperature. What good would that do? you may wonder. It is believed that a ghost creates a "cold spot" in the air in which it occupies (or has occupied) due to the usage of the energy from that spot. If you aim the device toward an area that registers colder than the surroundings you could have found a ghost. You've probably seen this emphasized in some of the latest ghost movies ("Sixth Sense", "The Haunting" and "Stir of Echoes" to name a few). Unfortunately it's usually not as easy as suddenly seeing your breath in front of you to see a ghost. It is said that you can feel a chill in the air when a ghost is present and some hunters have felt cold breezes. It is also said that these "cold spots" can be as much as 20-60 degrees colder than the surroundings. There has also been speculation about "hot spots" being created by ghosts, but is a lesser theory. This device could prove to be a trusty ally and could prove cost effective by cutting down on the number of film rolls you go through. This device is controversial in its non-contact models. The device shoots a beam that measures the temperature on at the end of that bean and not the air between the end and the device. Is this device able to pick up apparitional events? Earth's Magnetic Field - Well, this isn't really considered a hi-tech device, but it is an electronic sensing device. Best of all it's virtually free - you just need to know where to look for the information. The Earth's magnetic field is believed to have a direct effect on ghost activity, the more magnetic activity the more ghost activity. Gravity is at the root of this equation. Look for the full and new moons to conduct your research, it is supposed to help you get the greatest amount of activity. Unless you have a full or new moon during a solar flare, now that's when you should have luck. The sun has a direct effect on the Earth's magnetic field, it is constantly bombarding us with electromagnetism. It is especially strong during solar flares. It is useful to listen to the news or look for information about solar and lunar activity. A good site for information on Earth's magnetic activity is at the Space Environment Center (SEC) homepage with information provided by the National Oceanic and Atmospheric Administration. This site offers advisories and "today's space weather". There are other non-electrical methods (usually known as "new age" methods) that have been in use for many years. Some of these border with science, others with folklore, but these methods have been somewhat successfully used in the field for the purpose of detecting ghosts. Dowsing (divining rod, pendulum), scrying (crystal, mirror, fire, or water gazing), psychometry, automatic writing, seances, ouija boards, and even spirit photgraphy (yes, orbs) are included in this category. The major way that ghost hunters gather visual data is from cameras; 35MM, digital, Polaroid instant, and home video. Yes, all of these forms of picture taking are prone to tampering or having errors such as dust or static (or pixel problems with digital). Also in consideration is just plain misunderstanding of how a camera's lenses work, giving favorable results to strange phenomenon. I have read, studied, and experimented with ways to find out whether or not pictures are genuine or not from different sources. I've even asked a couple of photo lab technicians at different photo labs and gotten the same answers. The more I study cameras and film the easier it gets to spot a camera flare from a potential orb or other form of ghost. The most enjoyable task is to get a camera technician to talk about ghosts, they all seem to be completely afraid of the idea and always dispel any belief in them immediately. This is a typical response by someone who does not believe when you show them examples that they can't seem to explain, they always say there's a reason for why it happened. In their defense I have seen pictures that I was sure had possibility of being paranormal. In time, however, I saw how a picture can be doctored or how any light or reflection can put weird things in pictures. Basically, I was able to recreate these pictures very close to how they turned out. If a photo is a fake the taker either hasn't done their homework, or was just so excited that they dispelled all disbeliefs and feels they've arrived as a ghost hunter. I've seen hundreds of photos that the person swears the photo was genuine and the person refused skepticism. You have to have an open mind that swings both ways. I have seen photos that just makes my hair stand on end, you can just feel it when you see the real thing. Most ghost hunters have their heart in the right place, but we all have to know our way in and out of a camera. You should realize as well that orbs may not be ghosts at all and that they are confusing what we are studying. I guess we can all remember seeing the famous bigfoot footage of the mysterious beast walking across the woods and looking at the camera, this was believed to be real. Now we know that it was a setup, but the photographer received a lot of money and attention before anyone figured him out. The ghost hunters have nothing to lie about, then again there are scam artists among us as well (you can't escape them). Be careful of anyone trying to sell you anything (guarantees). Photographs are merely a small section of the large puzzle of ghost hunting and is not the major way of interpretation of the ghost world (our own brain is the best tool). I think a lot of ghost hunters have lost their focus and rely completely on photographs. You will never prove anything scientifically with a mere photograph. We must document record and use a scientific investigation method. Which is basically form a hypothesis (on specific thing), design a study, collect data, analyze data and draw conclusions, and report the findings. Easier said than done, but the only way to prove your work is to try to prove something, then in the next breath try to prove yourself wrong (if you don't someone else will). I've also learned that ghost hunting as a whole is generally looked at as something that should be taken seriously. An overwhelming majority of sites, especially official sites like this one, embrace a code of conduct while hunting or offering pictures. You'll find ghost hunters to be a very honest bunch who are willing to share every bit of knowledge in helping others. They do not believe in Ouija boards or witchcraft. They do not sneak into cemeteries to get photographs, they get permission. On top of all that they are nice to the spirit world (it's the only way to be accepted by them and to let them be photographed with great results!). This is a very controversial form of capturing proof of ghosts. Photographing ghosts on film or explaining why ghosts effect electrical devices is easier to explain than EVP. It has been determined that ghosts "live" in a world that is barely outside the human visible spectrum (and just barely inside the current camera technology's). Part two is that ghosts effect electrical appliances because they exist within an electromagnetic field themselves. Two difficult questions that can be answered in fairly simple terms and without dramatic explanation with a good portion of scientific backing to nearly prove them. Now, we have EVP. This describes the ability to take a normal tape recorder set it out and record ghost's voices that can not be heard by the human ear. It seems to work best with regular tapes, which in all fairness are magnetic in nature similar to a camera. These voices are sometimes very easy to understand and are never heard by the person who recorded them. Kind of strange and spooky if you think about it. A few times the person was talking to the spirit world and asked it a question and upon review of the tape the answer was heard. I guess it you lump it in with the analog/magnetic recording method that it exists just out of sensory range. It still remains hard to explain because this is a more controversial subject than picture taking of ghosts (which is still a heavy debate itself). Also, these sensing devices work differently with different forms of ghosts (which go way beyond what I have vaguely described in this site). So what do all of these fine contraptions do for you? Nothing in all honesty, until you have tied the readings or findings to an event. Technology is swell, but it has a tendency to get in the way. Developing an open mind and familiarizing yourself with your surroundings during an investigation without these devices will strengthen your senses. You will notice things you have never noticed before in nature. You will find yourself picking up sensations without equipment. Scary thought, but believe me, it gets rid of the shakes that you get when you first start investigating in the field. The scared feeling has a tendency to feel similar to when you are encountering activity, so the quicker you get over it the better you can judge what is happening to your body. When you realize you have a connection to the spirit world that comes from within and not equipment you will notice a change in the way you handle fear. Fear only gets in the way and seems to scare most ghosts away. These tools will become useful when you have confidence in yourself and your surroundings, but never let these tools do the work for you. My advice is if you are investigating a house have the owner turn off and unplug as many electrical devices as possible. Walk up the sidewalk with your equipment and monitor (have someone else record) the results. As you enter the house go no farther than five feet in any direction from the front door with the equipment (except with camera...I know it's still a piece of electrical equipment, but offers continuing proof of record). If there is any disturbance you should have determined it by then (if spirit is active). The thermal scanner is a poor thing to use indoors. If your results are lacking without the tools then use them sparingly for aid.